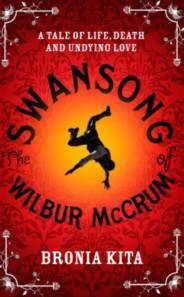 The Swansong of Wilbur McCrum is the warm and witty tale of an accidental outlaw trying to make his way in the world. Wilbur McCrum is not a lucky man. Actually, he’s not lucky, period — a fact that becomes obvious from the moment he first emerges, screaming, into the world — for Wilbur’s birth coincides with his sister’s death. And as Wilbur (prone to fits and with a pathological fear of cows) grows, he subsequently loses his father, and is then in turn lost — abandoned — by his mother. Dispossessed and passed from pillar to post, he’s eventually left with no choice but to take to the road, the wind at his back and ‘lucky’ potato in his pocket. As he searches for a place he can call home — somewhere far away from cows (easier said than done in the Wild West) — he encounters madmen, conmen, wenches and whores; embarks on a career robbing stagecoaches (initially unwittingly); falls in love, and into a well; escapes bounty hunters and body snatchers; and, erm, becomes a librarian. A dazzling and inventive first novel set in gold-rush-era America, The Swansong of Wilbur McCrum tells the story of an unlikely and largely unlucky life, from birth to books with a few near brushes with death in-between.